Mama Don't Camp: Slide Rock, Not Bedrock. Either Way, We Had a Gay Old Time. 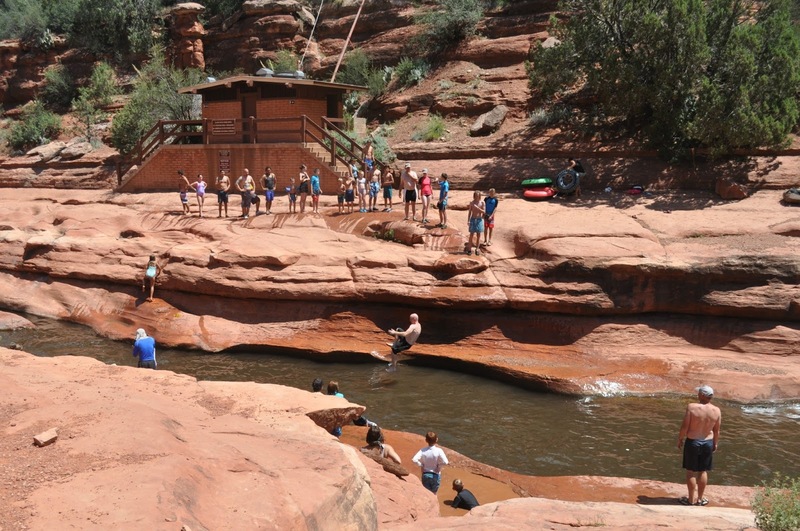 Slide Rock, Not Bedrock. Either Way, We Had a Gay Old Time. Following up our (much too short) visit to the Grand Canyon, we drove south to see Chris' parents in Phoenix. And what is is between Williams, AZ (where we caught the Grand Canyon Railway train) and Phoenix? One of the most beautiful places in the world: Sedona. I've only been to Sedona once. Several years before Chris and I had kids - so approximately three rounds of high school. Far too long. All of my research on what to do with kids in Sedona offered an emphatic endorsement of Slide Rock State Park. For some reason, "Slide Rock" reminds me of "Bedrock" and I had the Flintstones theme song in my head for a couple of days..."from the town of Slide Rock, it's a page right out of history..." And it really was reminiscent of scenes from that cartoon where modern luxuries are replicated with piles of rocks and wooden levers (and Pterodactyls). It was like a prehistoric swim club! Since online pictures featured people frolicking in the water among rocks (sliding, even), I made sure to bring waters shoes for everyone. I also read that it gets crowed after 10:00 a.m. and knew that we had to arrive early. I planned to leave Williams at 8:00 a.m. for the hour drive...so of course we left at 9:00 a.m. And the reports were correct. As we pulled in at 10:00 a.m. it was already packed with people (but still plenty of parking). There was a bit of a walk from the parking lot, but not too bad. And I made everyone "try" at the public restrooms by the entrance. There was a short flight of stairs and then THIS. We spent almost an hour at the first "pool" where the kids caught currents through natural underwater "slides". I really thought that was going to be it, but eventually, they asked if we could go further into the park for another slide. Before we got there though, we saw people jumping off a ledge into the water. George said, "I WANT TO DO THAT." If it was only teenagers, I would have told them, no. But I saw lots of kids waiting in line with their parents, so I assumed it must be safe (I'm such a sheep). I knew that the twins would be able to do it, but Oliver is like me - super cautious and likely to say, "yeah - no thanks" to anything that looks precarious. But he did it! We were there for over two hours, and I really wanted the kids to see more of Sedona, so I hustled them out. When I tried to plug in directions for another area attraction, my GPS said, "sorry Charlie, you're going to have to find a good old fashioned map because I'm out." Or "no signal" or something. We drove into town to find a map and ended up with ice cream cones and a consensus of three that it was too hot to do anything else. My plans to walk around Bell Rock and take in the scenery reverted to a drive by viewing. I did insist on one other stop though. After our incredible experience at New Mexico's Puye Cliff Dwellings, I definitely wanted to check out Montezuma's Castle. Luckily (for my pathetic children) there wasn't any climbing or significant walking involved. We just paid the $10 entrance fee and strolled past the ruins. I think we were there about 10 minutes. And it was made abundantly clear that even this was borderline child abuse.